PhotosynQ is an open source software and sensor platform where communities can identify, research, and implement new methods to solve their local problems. Our initial focus is on agriculture, where we’re bringing together researchers, extension, crop consultants, and farmers to develop precision ag solutions in markets largely ignored by ‘big ag’ (small farms, niche crops, developing world markets, etc.). 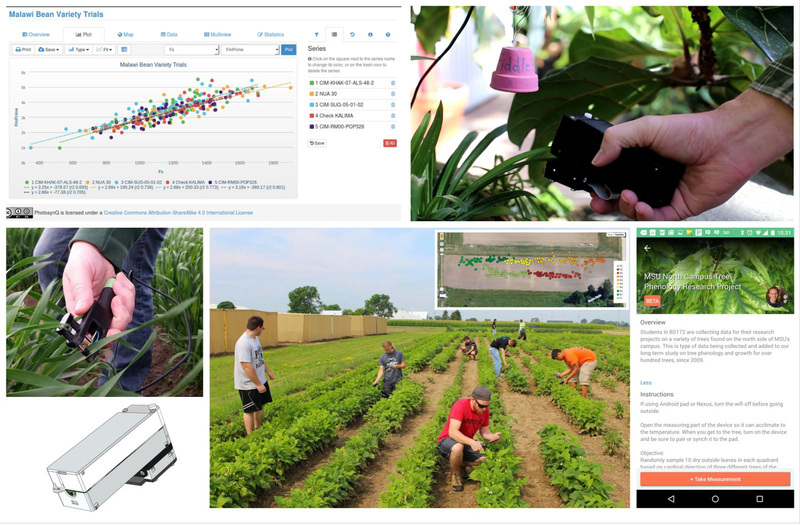 Examples include sensor-based methods for early identification of disease, mid-season prediction of yield, evaluating soil quality, and many others. Our perspective is that sharing data simply isn’t enough - data quality is paramount to produce results that actually matter. Data must be collected using consistent methods, comparable devices, with strategies to identify outliers. Even with all that in place, the community has to have the skills to collect, analyze, and interpret the data correctly with minimal mistakes. At the same time, every project’s data needs are different - different methods, devices, methods of analysis, etc. While consistency and flexibility seem at odds, we’ve worked hard to make a platform in which they both exist, and scaling from new user to a developer is relatively easy. Unlike Xively or other streaming IoT data sites, we’re not trying to be the solution to every IoT problem. If you’re trying to track the temperature in your garage, we’re probably not what you’re looking for. If you’re trying to collaborate across a community, solve a complex problem, and develop a sensor-enabled solution… we’re worth checking out. Go to www.photosynq.org for more. Hope to see you there!